The Occupy Wall Street movement may have started in New York, but now its picked up some unlikely supporters: Chinese pensioners. 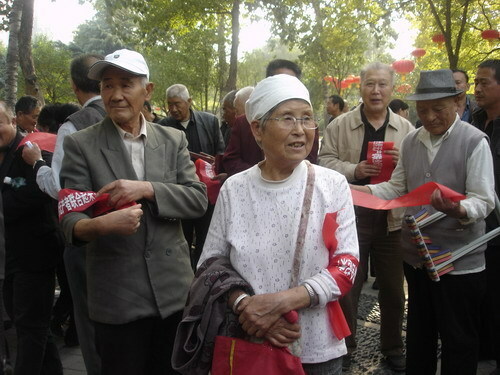 A group of mostly elderly citizens took to the streets of a northern Chinese city in support of the Occupy Wall Street protests, according to a post on nationalist Chinese website Utopia. But it seems the Chinese protests came with more of a nationalist twist. In the afternoon of October 6, a number of protesters appeared outside the Laborer‘s Culture Hall in Zhengzhou, a city of 7.1 million people in Henan province, Utopia reported. The site said the the protestors offered support to the the Occupy Wall Street movement, and quotes several of the protestors. 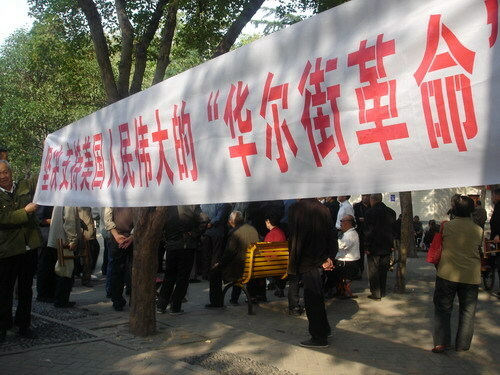 Protestors gather in Zhengzhou, some wearing bands reading "Determinedly support the great Occupy Wall Street movement"
“America is creating havoc over the world, starting wars whenever it wants to, interfering with the politics of other countries, and beating other countries with the stick of Democracy,” the post quotes one protester as saying. 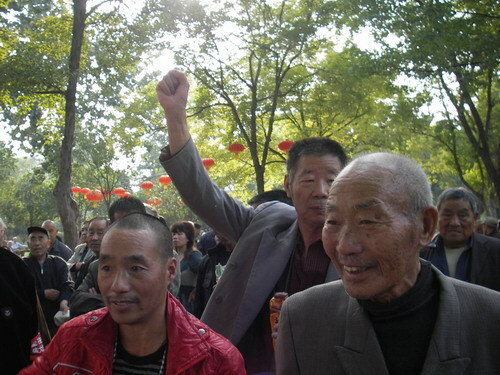 One middle-aged migrant worker from Shandong province said that Socialism could save the world, and save China. One banner offering support for a "Wall Street Revolution"
“Although Mao is gone, the internationalism he taught us still is still present,” the post concludes. The website reporting the protest, Utopia, is known in China for its support of far-left, Maoist views, and its strong nationalism. The website was hacked in July this year, as part of a dispute which broke out after Chinese media company Caixin published an article containing strong criticisms of Mao Zedong. 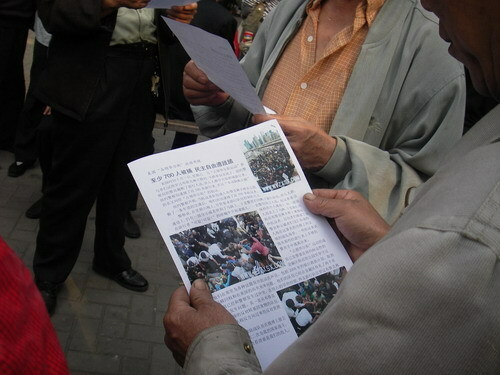 Photos of the Zhengzhou protest also appeared on the website of Chinese nationalist paper The Global Times.